Dr. AK Mittal, CMD, NBCC (I) Ltd.
Dr. Anoop Kumar Mittal, CMD, NBCC, has been conferred with the PSU Leadership Award at the India Concord Summit & Awards 2018 organised by Anthronik on October 26, 2018 at The Ashok, New Delhi in association with Make in India & SCOPE. The award was given away by Dr. Priya Ranjan Trivedi, President, Confederation of Indian Universities (CIU); Founder Chancellor, The Global Open University Nagaland and Founder Chancellor, Indira Gandhi Technological and Medical Sciences University, Arunachal Pradesh. The award was received by P.S. 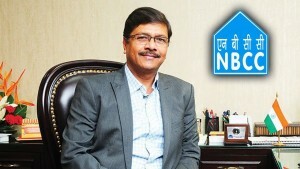 Rao, General Manager, NBCC (India) Limited on behalf of Dr. Mittal.